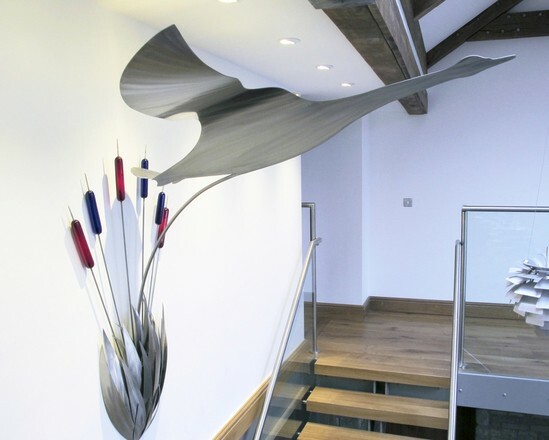 This was is a stainless steel sculpture featuring a swan in flight above a cluster of bullrushes. It was a private commission for a new renovation. The stairs, in oak, stainless steel and glass, had a central rise going to the wall that then turned in both directions to provide access to both sides of the house. 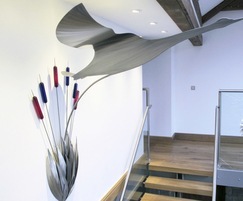 The client wanted a stainless steel swan flying overhead as the stairs were climbed. The bullrushes in the background were made in glass to complement the stained glass used in the windows. The main issue here was to secure the sculpture in such a way that allowed easy removal for redecorating the walls.